When entering Donations, use the Accounting Code field to designate where the monies are going in your Accounting Program. If you are not using the integration with QuickBooks, which sends Every Individual Transaction to QuickBooks, consider running a report of Accounting Code Subtotals to help with your manual reconciliation with QuickBooks or another accounting program. The Accounting Code field is useful for running reports to help reconcile with your Accounting program. 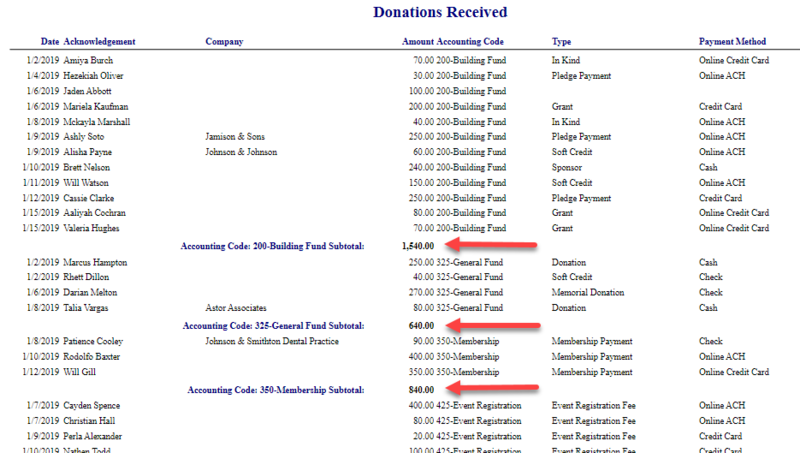 To display subtotals for each Accounting Code in the end report, use the Reports > Donation Activity > Donations Received report. Under the Other Report Settings, select the Landscape orientation and include the Accounting Code as one of your three fields. Under the Group (subtotal) By setting, choose Accounting Code.